Leni Riefenstahl, center, stands with Adolf Hitler, right, and Propaganda Minister Joseph Goebbels, foreground left, at her Berlin mansion on March 10, 1938. BERLIN - Leni Riefenstahl, the legendary filmmaker reviled and revered for movies she made about Adolf Hitler and his Third Reich, has died — one of the last confidantes of the Nazi dictator. She was 101. Riefenstahl died Monday night at her home in the Bavarian lakeside village where she had lived for 20 years, the kind of idyllic setting that reflected the well-groomed aesthetic of her films and art. No cause of death was announced. She made four films for Hitler, the best known of which were "Triumph of the Will," her masterwork recording the Nazi's 1934 rally at Nuremberg, and "Olympia," a meditation on muscle and movement at the 1936 Berlin Olympic games. Both films accented her artistry, but more troubling to her critics, presented the Nazis to the world as peaceful and tolerant. Her portrayal of Olympic sports was sensual and stunning; her depiction of the Nuremberg rally shows Hitler in godlike poses and apple-cheeked children handing him flowers. German Culture Minister Christina Weiss said Riefenstahl's life tragically demonstrated the inseparable link between art and politics. "Her career shows that ... art is never unpolitical, and that form and content cannot be separated from one another," Weiss said. Born Helene Bertha Amalie Riefenstahl on Aug. 22, 1902, the daughter of a heating firm owner started out as a creative dancer. A knee injury made her shift to movies, where she featured in daredevil silent roles set in the Alps. 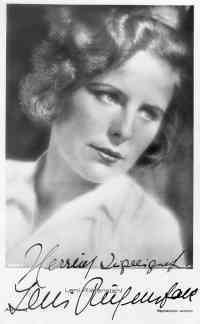 In 1932 she starred in the self-directed "The Blue Light," which celebrated Germany's Alpine mystique — and reputedly enthralled Hitler. That same year, Riefenstahl, then 30, heard Hitler speak at a rally and wrote to him offering her talents. In her memoirs, she rapturously described her first impression of him. "It seemed as if the earth's surface were spreading out in front of me, like a hemisphere that suddenly splits apart in the middle, spewing out an enormous jet of water, so powerful that it touched the sky and shook the earth," she said. "I felt quite paralyzed." Many suspected Riefenstahl of being Hitler's lover, which she denied. After the war, Riefenstahl spent three years under Allied arrest. Though war tribunals ultimately cleared her of wrongdoing and she could point out that she never joined the Nazi party, the suspicion of being a Nazi collaborator stuck. As late as 2002, Riefenstahl was investigated for Holocaust denial after she said she did not know that Gypsies taken from concentration camps to be used as extras in one of her wartime films later died in the camps. Authorities eventually dropped the case. Riefenstahl herself seemed ambiguous about how close she was to the Nazi center of power. She said she knew nothing of Hitler's "final solution" to exterminate the Jews and learned about concentration camps only after the war. But she also said she confronted the Fuehrer about anti-Semitism. Speaking to The Associated Press just before her 100th birthday on Aug. 22, 2002, Riefenstahl dramatically said she has "apologized for ever being born" but that she should not be criticized for her masterful films. "I don't know what I should apologize for," she said. "I cannot apologize, for example, for having made the film "Triumph of the Will" — it won the top prize. All my films won prizes." Riefenstahl said she was always guided by the search for beauty — whether it was the hypnotic images thousands of goose-stepping soldiers in Nuremberg or in her critically acclaimed photographs of the Nuba people. "Through my optimism, I naturally prefer and capture the beauty in life," she said. An acclaimed pioneer of film and photographic techniques, Riefenstahl's career was a quest for adventure. Even as she turned 100 last year, she was strapping on scuba gear to photograph sharks. Boycotted for years after the war, Riefenstahl made a comeback of sorts in the 1960s when she lived with and photographed the Nuba in Sudan. She next turned to underwater photography, learning to dive at age 72. Around this time she met Horst Kettner, a fellow photographer half her age who became her live-in assistant and companion. Whenever she exhibited at German galleries, controversy erupted because of her past. Despite — or perhaps because of — her notorious image, Riefenstahl enjoyed a certain pop star status outside of Germany. She photographed Rolling Stones' Mick Jagger and his then-wife, Bianca, in the 1970s. Clips from "Olympia" appear in music videos. Leni Riefenstahl computer screen savers can be found on the Internet. Riefenstahl complained about injuries from accidents over the years, including a helicopter crash in Sudan in 2000 that left her in constant pain. She reportedly had cancer surgery last year. "I want to fall asleep, feel well, and then everything ends. Goodbye," the native Berliner imagined her death in a magazine interview last year. "That must be very beautiful." Kettner was at her side when she died at the villa they shared in Poecking, a town of 5,600 south of Munich. "Her heart simply stopped," he was quoted as saying by the German magazine Bunte. Few except close neighbors had much contact with her in the 20 years she lived there, Mayor Rainer Schnitzler said Tuesday. The house sits behind high trees on a gated road. Riefenstahl was married once, in 1944 to army Major Peter Jacob, but the couple split three years later. She had no children, and her only sibling, Heinz, was killed on the eastern front during World War II. A funeral was planned Friday in Munich. Spanish Falangist Ramón Serrano Súner also died at 101 on September 1. Sad that she's dead now. At least she could enjoy a long life, despite of the hatred of left-liberal "culture" establishment. Here one could read again everywhere, that she was not simply the film producer Leni Riefenstahl, but "the controversial film producer Leni Riefenstahl". The word umstritten (controversial) is a sort of title that media stick on every person who they stigmatize to be somehow a "right winger", and so names of these people can't be thought anymore without the little word umstritten: Ernst Jünger was a "controversial author", Haider is a "controversial politician", Walser became suddenly a "controversial author" when he started criticizing the Holocaust Industry. But it's a term that only is used in connection with "right wingers". Neither left authors like Brecht or Grass nor neo-Communist politicians such as Gysi, also not establishment politicians like Schröder or Fischer would be titled with this word by the media - as if all that what they say or write wasn't "controversial" at all!! This single word is a good example for the all-time brainwashing of the media that strikes roots in people's minds when it is done again and again. I find the statement "apologizing for ever being born" quite sad. It seems sarcastic, but this woman has been attacked and accused of all sorts of things for most of her life. I heard that Jodi Foster was consulting with her and planning to make a movie about her life. I wonder if anything will come of that? Yes, it is sad. Unfortunately for everyone, many amongst the people we deal with cannot comprehend the idea of forgiveness for someone of whom they have had disagreement, even if it was something that took place decades ago. The fact that she had a great love of life, was beautiful, highly intelligent, and did excellent film work, made them only hate her all the more. I really would not call her highly intelligent. What would you call her then?